This Hit Caused a Concussion. It Was Also Legal. Discuss. Last Sunday night in Seattle, in the midst of a marquee matchup, the San Francisco 49ers began marching down the field in the first quarter, trailing the Seahawks 14-0. On Seattle’s 20 on third down, quarterback Colin Kaepernick found his one-time Pro Bowl tight end, Vernon Davis, on the sideline inside the 5. 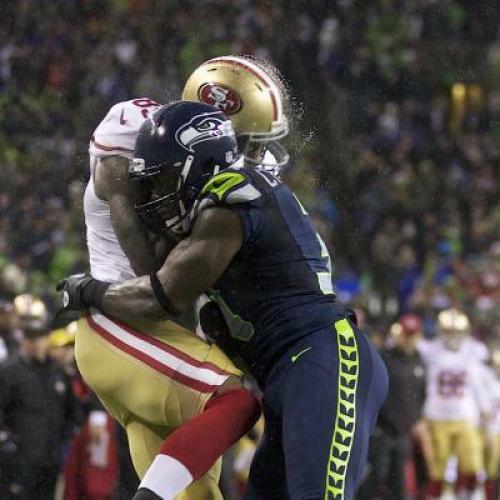 After the ball arrived but before Davis could fully hold onto it, Seahawks safety Kam Chancellor jetted in and with full force used his shoulder to knock Davis’ chest, sending the ball flying irrelevantly away. Almost immediately, two yellow flags—from two nearby referees—flew in. The call: unnecessary roughness on Chancellor. The result: 10-yard penalty, first-and-ten Niners on the 10-yard-line. Welcome to football in 2012: something is happening here, but we don’t know quite what to do about it yet. As we learn more about the link between hard hits and permanent brain damage, we are having trouble deciding exactly how much roughness is tolerable. Chancellor was just doing his job, in this case spectacularly well. The safety is supposed to be a team’s last line of defense. Since Davis was open and would likely have made a catch a few yards from the end zone, Chancellor’s only resort was to hit Davis hard enough to make him drop it, which is exactly what happened. But did the referees make the incorrect call? You could argue that, the hit’s legality notwithstanding, they were in the right. For the rulebook also states, “If in doubt about a roughness call or potentially dangerous tactics, the covering official(s) should always call unnecessary roughness.” So we see that the referees aren’t really to blame: the play is happening incredibly fast, the hit was certainly vicious, and so they erred on the side of calling it. Moreover, roughness penalties are not challengeable or reviewable. The trouble, then, is with the rulebook itself. All this must have been little consolation to the Seahawks. An incomplete pass (which is what the play would have been without the penalty) would have probably resulted in a 37-yard field goal attempt by the Niners; instead, San Francisco was given three additional plays to score a touchdown in the red zone, and, if they still failed to punch it in, a shorter field goal attempt. (As it happens, the Niners did not reach the end zone, and their 21-yard field goal was blocked and returned by Seattle for a touchdown. A wise man once said: ball don’t lie.) It must also be little consolation to Chancellor, who was penalized for doing his job and who in the future will perceive his options as either causing another penalty or allowing a touchdown. And, of course, it’s also little consolation to Davis, who suffered a concussion, forcing him to miss three quarters of his team’s most important game and maybe this weekend’s game as well. Finally, it’s little consolation to the fans. Bad calls deny them a fair competition. Ultimately, though, who has the biggest grievance is not the largest question Chancellor’s tackle raised. Instead, what the league, the players, and the fans—ideally without Commissioner Roger Goodell’s trademark, blind-rhinosceros-like, ignorant steamrolling—collectively need to decide is whether it is okay for a sport to have concussion-causing hits that are also legal. And the slippery slope doesn’t end there. Given that so-called sub-concussive hits—head-on-head collisions that do not result in concussions, of the sort that occur at the line of scrimmage during every play—can also lead to permanent brain damage, should they, too, be restricted? Perhaps; but if we just purely follow that instinct and if technology, in the form of better helmets for example, does not come to the rescue, then the NFL will eventually become tackle-less 7-on-7, and until it does, it will be a severely bastardized and less popular version of its platonic ideal. There is evidence this worst-of-both-worlds process has already begun. As 2011’s unprecedented passing numbers suggest, the new rules have led to a cheapened quality of gameplay in which offenses glide down the field with a frequency that makes it less enjoyable. (Remember in baseball when all those home runs ceased being cool and started being tiresome?) Probably not coincidentally, NFL viewership, though still the envy of every other type of television programming, has fallen each of the past two seasons, dating roughly to a peak of 2010—exactly the season when Goodell began to crack down ostentatiously on violent hits, leveling huge fines and almost engaging in feuds with certain players, most notably Pittsburgh Steelers linebacker James Harrison. The alternative to this slow path toward flag football is to acknowledge the dangers of the game, and draw certain lines—again, ideally with the sort of creativity, authority, and conscience that the commissioner’s office currently lacks. When you are choosing anything other than a dogmatic option, your lines are going to represent a compromise, but that does not mean they cannot be fabricated thoughtfully and with the buy-in of all interested parties. Just as it is presumptuous of fans to tell players what level of unsafeness should be tolerable, it is also presumptuous of fans to tell players what level of unsafeness should be intolerable; and any fan has the individual right to abstain from football (although given absurd taxpayer subsidies for stadiums, full divestment might be trickier). Then, with the lines having been drawn, referees should be encouraged not to err on the side of calling unnecessary roughness, but to err on the side of being right. It will not eliminate bad calls, but it will reduce them, and it will give the league’s employees—the players—a better sense of how to do their jobs. To slightly alter Justice Brandeis’ observation, it is roughly as important that the laws be settled as that they be settled correctly. Football may be unsalvageable—it’s entirely possible that twenty years from now, we’ll be watching (shudder) soccer on autumn Sundays. But until the league, the players, and society agree to send football the way of the dodo bird—or at least of boxing—it makes no sense to have vague rules inconsistently applied. Either don’t let them play, or let them play.